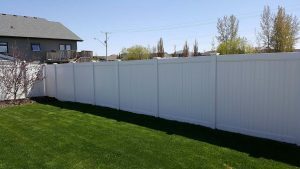 Is Vinyl Fencing For You? 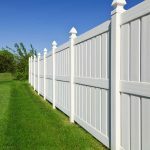 Vinyl fencing has become the popular choice of fencing materials over the years because of its numerous beneficial features that homeowners love. DFS fencing products have been designed and manufactured to meet homeowners needs when it comes to quality, low maintenance, durability and warranty that can be lacking in other fences. A wood fence will rot and require many hours and dollars of maintenance over the year. Thus, vinyl has become the best fencing option for most property and homeowners today. We have listed a few of the many features and benefits you will find with your vinyl fence. A vinyl fence only requires a little maintenance to keep it looking beautiful. In most cases all you need is a hose to clean it unlike wood that needs continual painting or staining. Vinyl with our exclusive Colour Lock formulation will retain its colour wonderfully without repainting like you would with a wooden fence. This will help you save time and money on costly repairs and expensive maintenance supplies. It is the perfect choice for those who want a beautiful fence without having to continually work hard for it. Many said that Vinyl is about five times stronger than wood. It is not susceptible to termites, rust, and decay which can last for decades compared to wood and metal. Moreover, vinyl doesn’t absorb moisture like wood which causes it to blister, rot, and peel. Thus, vinyl fence is the preferable choice for horses and often used in swimming pool and seaside environments where direct exposure to salt water is not good for wood and metal fences. When you consider a wood fence’s maintenance, vinyl helps you to save more money over the long-term compared to wood and iron. You will not need to spend extra on paints, stains, treatments, and even the whole wood fence replacement when it rots. Using our post and collar system it eliminates the tailings left over compared to an augured hole installation. Pipes are driven approx. 48” into the ground and two post collars are attached. There are no messy dirt piles left over after this is complete. Watch our install video or read through our instructions for more details. Vinyl fence comes with many different styles to choose from privacy, picket, pool and ranch rail fences. You can choose any design that compliments your landscape and desire. There are also five colours choices with colours in select styles. Also, if you would like a vinyl fence custom made for you it can be done. For a complete list of styles and colours look at our catalogue and brochure. DFS Vinyl fencing can also provide privacy and safety for your family, friends, pets, and even your garden. 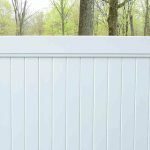 One great feature is that you will not need to worry about your kids or pets getting slivers like you can from a wood fence. Your fence can also act as a wind break from strong wind that can blow through your property. Vinyl Fence is also perfect for pool enclosures when accompanied with a safety Nationwide Industries pool latch on your gate. DFS vinyl fences come with a Limited Lifetime Warranty that provides you with comfort and confidence as your fence faces inevitable foes like winter weather and strong winds. We manufacture our fences using some of the best additives and molds on the market. It is built tough, so you will not have to worry about the longevity of your fence. Your fence is an investment and you want a warranty and company that will back it up.